Transportation and healthcare providers are now facing a confluence of three major challenges, creating a "perfect storm". Spurred by increasing financial pressures, changing demographics, and disruptive technology within the industry, legacy paratransit software solutions are proving ineffective. However, Ecolane's Legacy Replacement Program, which enables providers to advance beyond their legacy systems and leverage next-generation transit technology, allows agencies to proactively address these challenges without incurring the high upfront costs often associated with a complete system overhaul. 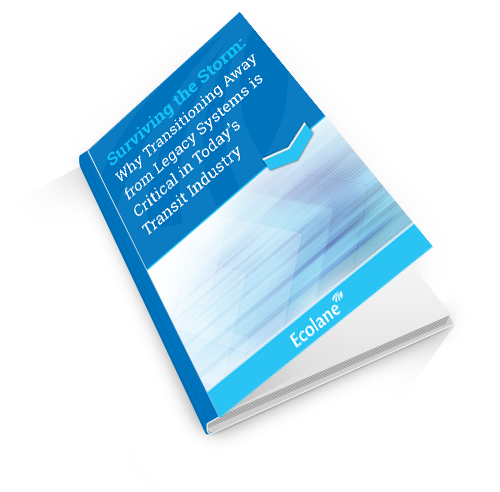 Surviving the Storm: Why Transitioning Away from Legacy Systems is Critical in Today's Transit Industry offers a more detailed description of the program and how it can help agencies and providers overcome obstacles and stay ahead of the competition.